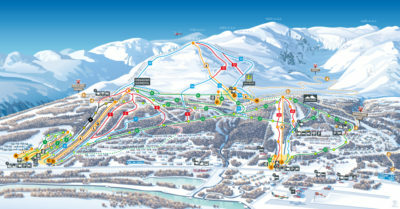 Hemavan has a large variety of pistes for all the family! There is also plenty of opportunity to head out onto untouched snow. The Länken lift takes you quickly and easily from the top of Centrumliften to Kungsliften’s base station. All lifts close at 14:00 on Christmas Eve. In the piste and weather report below you will find current information about weather, open/closed lifts/slopes and the current snow depth.